Every year since as long as I have watched and payed attention to sports, I have filled out a March Madness bracket, like many other people around the world. I have not been in many pools, and have only really been in one that had a prize, but I can say I won that one. It was 2011 and I was in my track teams long distance runners pool. I picked UConn to win that year after I saw Kemba Walker hit a buzzer beater vs Pitt in the Big East tournament. It came down to the championship game of the NCAA tournament, where my friend and I both had UConn winning, and were tied in points up to that point, so the tiebreaker was the total of the final score. I guessed the final score would be low, and he went high. The final score ended up being 53-41, which is pretty low, giving me the victory! I only won a bag of candy, but it was awesome winning. This year, I set up a big group on ESPN with a bunch of my friends. The skill level ranges from people who have not watched a single college basketball game this year, people who know some of the teams and who is usually good, and people who watch a lot of games every year. The range of brackets is crazy. The most popular winners on ESPN are Kansas (25%), Michigan St (22.3), UNC (14.6), and Oklahoma (6.1). In this pool there are 16 brackets. The most popular champions are Kansas (5 people), UNC (3), Miami (2), Michigan St (1), Virginia (1), Utah (1), Kentucky (1), Syracuse (1), and UConn (1). My winner is UNC this year. They are one of my favorite teams, and they played well this year, winning the conference regular season and tournament, and being the second 1 seed. Through the first day of the madness, I am sitting tied for 7/16 in my group, 61.4 percentile of all ESPN brackets. I have 110 points, which means I got 11 games out of 16 correct today. I got both 8 vs 9 games correct today (UConn and Butler), but I picked against the upset with Yale vs Baylor, and for the upset with Iona vs Iowa St, and those went the wrong way for me. The Baylor game hurts 14 brackets in the group, but 13 of those 14 had them losing in the next round. Only 1 had them going farther, to the sweet 16. Watching the Purdue vs Little Rock game, going into double OT, it was very intense. I had Purdue going to the elite eight, but Little Rock pulled off the 12-5 update. This hurts my bracket,, and my brain and heart are conflicted, but watching the UMiami game, and seeing them come back and take the lead, it makes me feel a little bit better. Thats only 1 elite eight team out, I still have 7 more to go, lets see how it goes the rest of the night, and the tournament. I picks both Utah and Kentucky to win, but I am actively rooting for them to lose. They would both be pretty big upsets, with Utah being a 3 seed, and Kentucky being a 4 seed, and I really do not like Kentucky. The bracket reason I want them to lose is because 15/16 brackets in my pool have these two teams winning, so everyone would get 10 points, but I have both of these teams losing in the round of 32. Most brackets have them going much farther, with one even having Utah as the winner. This means the other brackets would lose out on a lot more potential points, because if they lose, they obviously can not win any more games. 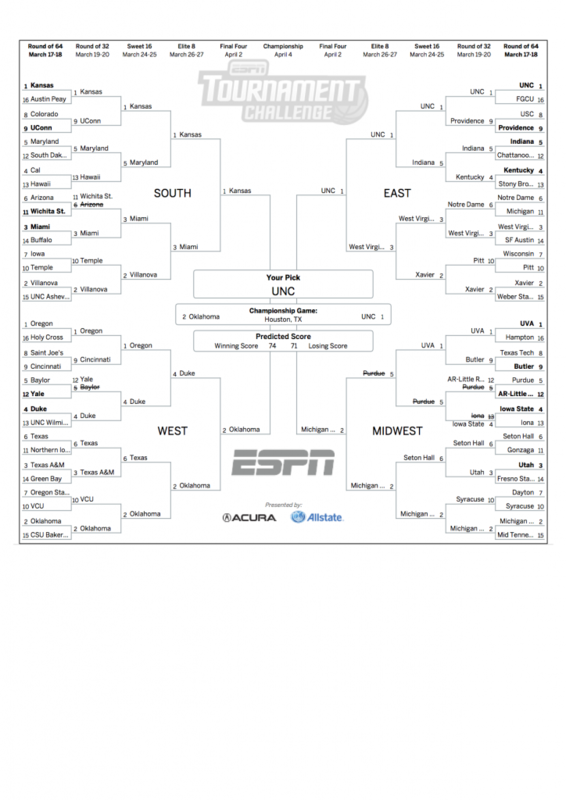 This would be great for the March Madness upsets, and for not my bracket, but for winning my pool. Unfortunately in the Utah game, when Fresno State took the lead in the middle of the second half, Utah went on a 19-2 run to put the game away, so I just have to hope Utah loses next game. On a good note, UNC took care of business today and won as a 1 seed. This means 4 of my elite eight teams won their first game, with 1 losing. The other 3 will play on the second day of the round of 64, so we will have to wait until tomorrow to see if my elite eight will stay with only 1 knocked out so far. This happens every year. I pick a 3 or 4 seed to make it to the elite eight, and they get knocked out the first or second round. Last year it was Iowa State, this year Purdue. Watching Providence have so many chances to take the lead in the final 2 minutes against USC, and failing to do so was nerve-racking. USC could not make their free throws at all, and Providence had about 3 chances in the last 15 seconds. They had the ball under their own hoop with 3 seconds left, made an amazing inbounds play that left a player wide open under the basket, and finally took the lead by 1 with 1.6 seconds left. This was a evenly matched game, with both teams leading by 7 for their largest leads, and there being over 12 lead changes and 4 ties throughout the game. I ended up overestimating Arizona vs Wichita State. I know Wichita State and Ron Baker were a very capable team, but I thought Arizona would want to go far, and they definitely had the ability, they just did not play well, and Wichita State wanted it more. As long as Wichita State does not win the next game, this only sets me back one game, but picking this game was about split 50/50 in the bracket pool, so about half the brackets got it right, and the other half got it wrong. Kentucky won there game by almost 30 points, so I am hoping they will lose their next game and Indiana will help my bracket. I am currently watching the Seton Hall and Gonzaga game. Gonzaga currently holds a lead early in the second half, but I hope Seton Hall will be able to pull this off. This was also a game many people were picking Gonzaga in, so I wanted to go against everyone and pick Seton Hall. I really have to learn who to listen to, because many people say many different things. This is the last game of the night, so after this, I will know exactly how my bracket did the first day of March Madness 2016. Gonzaga just beat Seton Hall, which means there will be 7 lower seed wins today, out of 16 possible games. This makes me feel a little bit better about my bracket, but 3 of those were 8/9 games, and I got all 3. I should have known better for some of the upsets I made, and did not make, but at least I did not lose anyone big except Purdue in the elite eight. Through the first day of the madness, I am sitting tied for 7/16 in my group, 61.4 percentile of all ESPN brackets. I have 110 points, which means I got 11 games out of 16 correct today. Check out my updated bracket at the end of the first day! Come back tomorrow for analysis of the second half of the round of 64 and my bracket!